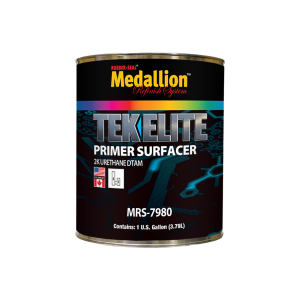 TEK ELITE Primer Surfacer is a two-component, urethane primer with excellent film-build and sands easily. It has excellent adhesion properties and can be used on a variety of automotive substrates. MRS-7980 is easy to spray and levels to an almost texture-free surface. It mixes 4 to 1 with MRS-798 TEK ELITE Primer Activator. MRS-7980 is available in Grey, Black and White. Packaged in quarts and gallons.